HJ: Most people unconsciously make their happiness conditional, however, happiness grows and thrives when we make it unconditional. It’s tempting to think ‘I will be happy when…’, however, the truth is that this is a trap, because you will actually be happy when you achieve whatever goal you set… for a little while. And then you will sink back into dissatisfaction and setup the cycle of longing and wanting all over again. 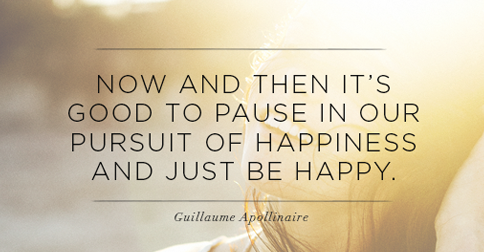 The happiness you experience as a result of ‘I will be happy when…’ is transient and does not last. But the happiness that comes from accepting your life as it is now and being grateful for everything you have and have experienced, is authentic, lasting happiness. This is happiness that keeps on giving as long as you can remain centered in this state. It is unconditional happiness and the article below is all about how to get there… right now. The other day, I was having dinner with a friend. She spoke with her usual complaints. But this time, she told me that she’ll eventually leave her husband. “Eventually,” she said, she’ll find another man to love. I listened to all her excuses. She, like a lot of other women, is not in love with her husband. She’s got a wonderful kid. She’s got a beautiful home. She has the financial freedom to be able to leave her husband. She said that her biggest reason is fear. Even though she was successful, even though she had a beautiful son, she lived her life in fear, and she felt like her time was past. Eventually will never come. Eventually will never be there. Right now, the way you are in your life is exactly, is the best moment you are in your life. As we get older, we just age. We, every single day, wait for eventually to happen. Our “eventually” excuses are always the same. Eventually, I’ll be able to have more money. Eventually, I’ll be able to take that trip. Eventually, I’ll have enough courage to go and start my business. Eventually, I’ll be able to go and leave my husband, lead my life and meet somebody great. We live our life full of the word eventually. And not to scare you, but you may get hit by a bus today, struck by lighting, go swimming in the ocean and get attacked by a shark or contract an incurable terminal disease. I hope none of that happens to you, but hey, you never know. Life is all we have in the present moment, so appreciate it every single day. When you wake up in the morning, you need to realize that today is all you have. You don’t have eventually. You don’t have a series of eventually. The beauty of life is today. How are you going to make the most of it? Also, who are you? It’s time to start accepting yourself for who you are. So many of us are constantly pushing ourselves to the max so that our eventually is an amazing place. We’re pushing ourselves all the time, trying to make our life so magical and wondrous. Some of us are chronic workaholics and don’t know how to enjoy the present moment; some of us are the exact opposite and never start anything or build things for long-term use. So understand your limitations. Work on what you can work on, but accept yourself for who you are — who you are right now is exactly who you’re supposed to be. You need to appreciate everything in the now. You need to be so present in the now that you are inspired every day to be the most amazing person you can be, based on who you are right now. Craft a life based on who you are. For example: There are things I don’t like to do. So I hire people to do them. Sure, it costs me money to do this. Sure I put less money in my pocket every single year. But you know what? I don’t spend the time frustrated, angry, annoyed, or stressed out because I couldn’t do something, because I had to do something that I did not like. I don’t do anything in my life I do not like. My life is set up to be pure pleasure, and that’s how life should be. We should be able to set our lives up exactly the way we want, because we only have one shot at this magical ride called life. No eventually that won’t happen, because the magic moment of life is now. When you finally do get to wherever it eventually leads you to, there’s going to be another eventually in your life, another series of things that you need to accomplish. When we all die, what’s written on our tombstone is not the to-do list, not the series of “eventually”s. People will remember you and how you touched their lives, how present you were when you were with them. It’s time to become more present. Love your life, love who you are, accept yourself for what you are. And you’ll be there right now. You won’t be looking at the perpetual treadmill of “eventually”s. For more by David Wygant, click here.